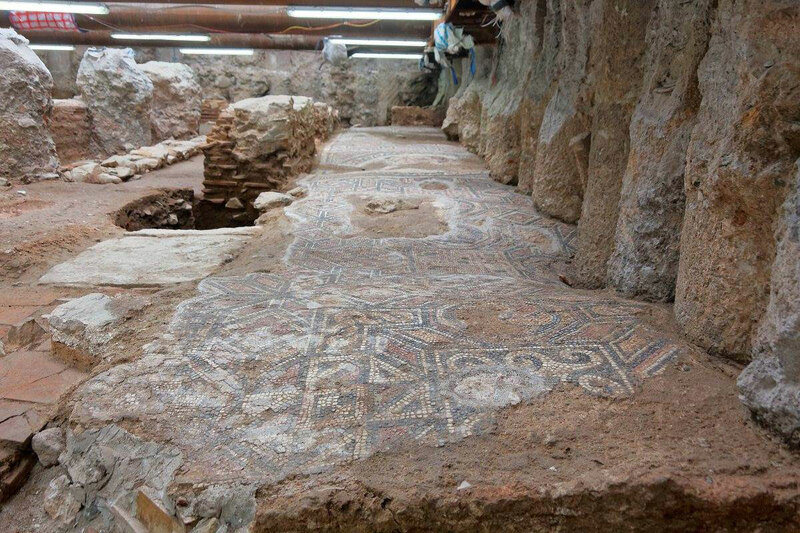 Mosaic floors dating from the 4th and 5th centuries AD, found at the south entrance of the Aghia Sophia station of the Thessaloniki Metro (photo: Ministry of Culture and Sports). The impressive mosaic floors dating from the 4th and 5th century AD and found on the south entrance of the Aghia Sophia station of the Thessaloniki Metro, are to be removed and conserved. 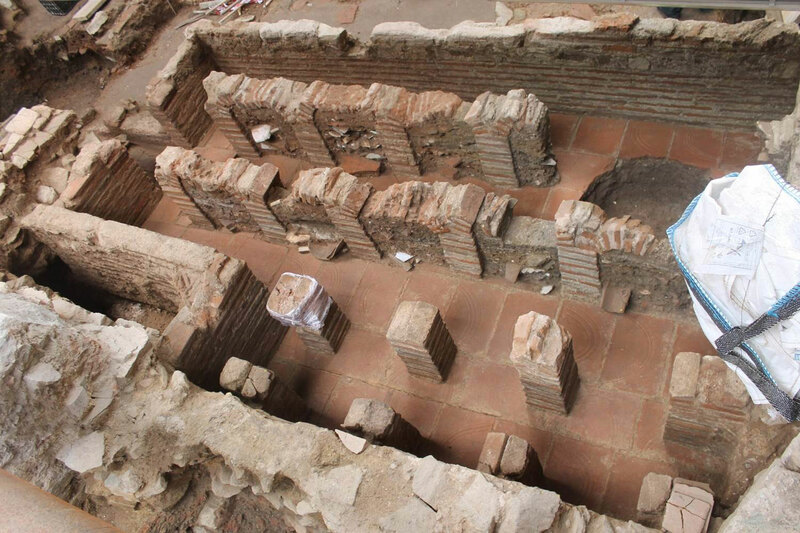 They were located under the semicircular marble paved public square of the 6th century. 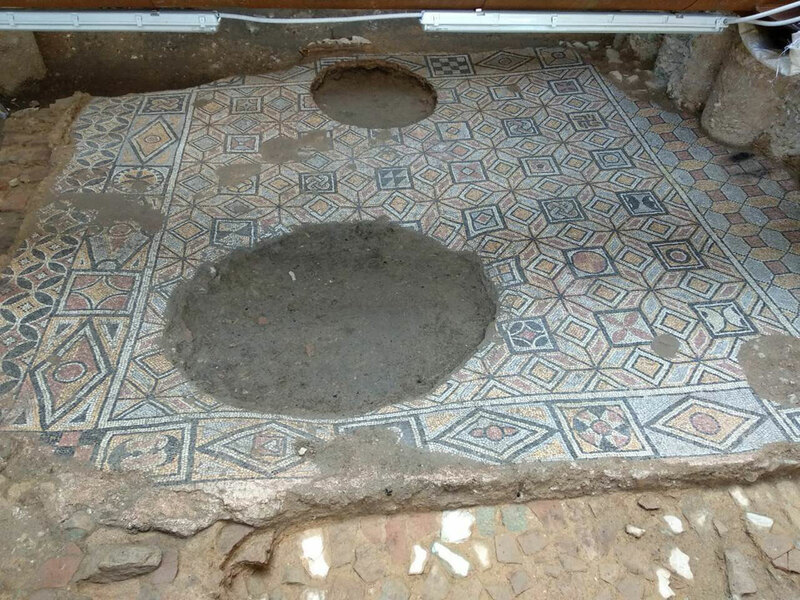 The very well preserved hypocaust bath found at the same site will also be removed to be used as an exhibit, while it will be decided, in cooperation with the Attiko Metro, in what part of the station the better preserved mosaic floors can be displayed. The above were unanimously approved by the members of the Central Archaeological Council (CAC), after being informed about the latest very impressive finds that recently came to light during construction work on the Thessaloniki Metro. Specifically, under the semicircular public square of the south entrance of the Aghia Sophia station (which has been temporarily removed and will be returned after the end of the excavations and the designing of the entrance) a large complex of Late Antiquity was unearthed, covering an area of about 315 sq.m., with successive phases that date from the first half of the 4th century and the 5th century AD. A section of the western colonnade of an atrium was found which communicates through openings with a long open space, five rooms placed in sequence, a complete hypocaust bath well preserved and very beautiful mosaic floors made of natural, multicoloured stones. 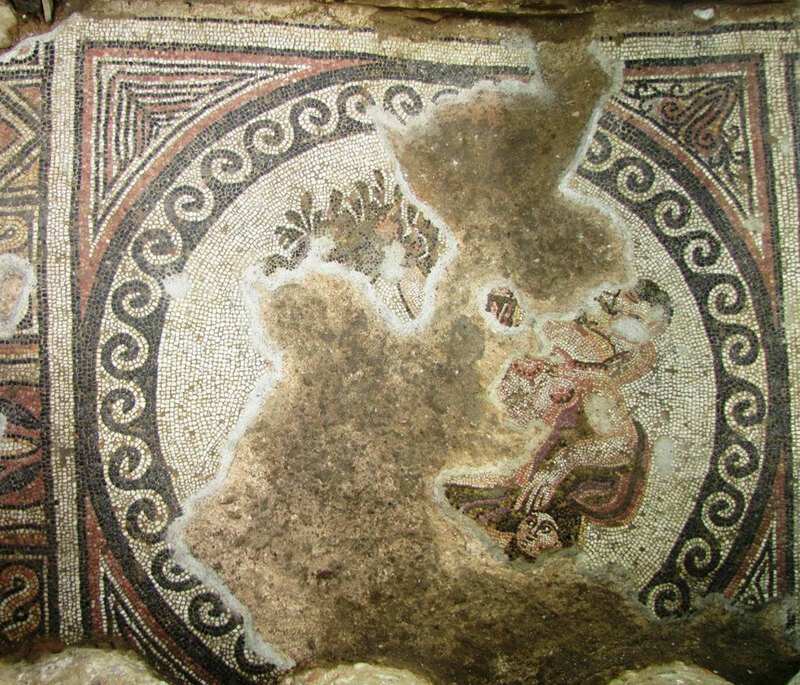 In places these mosaics have been destroyed by the opening of large holes (for the making of cesspits during the Ottoman period), while many walls of the rooms have been entirely removed since antiquity to reuse their materials. 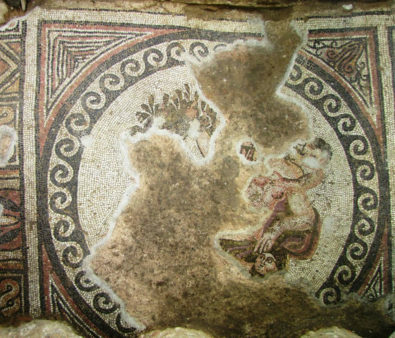 The mosaics’ decoration is geometric, while in the centre of one of them is a image of a woman, possibly Aphrodite, within a medallion. “Unfortunately, most likely in antiquity, this figure’s head was removed, which most probably was Aphrodite, as the face of a cupid can be seen clasping her, while her hand is resting on a couch where the figure of Medusa stands out”, said head of the Ephorate of Antiquities of the City of Thessaloniki, Polyxeni Adam-Veleni to the members of the CAC, pointing out that the complex was probably “a large town villa (villa urbana)in the city centre” as the bath’s size indicates, which is suited to a house. “There are many such residences in Thessaloniki of this period; at least 18 more have been found. In the 2nd half of the 4th century, after the founding of Constantinople, many officials settled in the city where many very large houses are built” added Mrs Veleni, also informing her audience about the city’s successive redevelopments in Late Antiquity. “Galerius redeveloped the city. 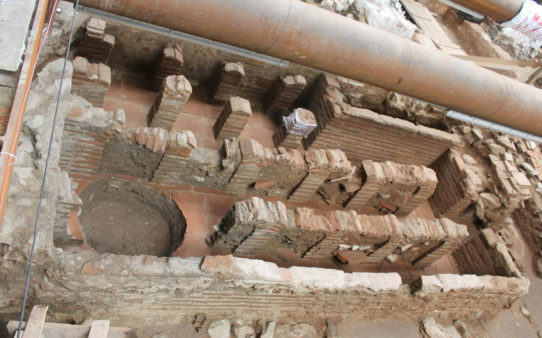 Subsequently, it seems that Constantine the Great also gave a new impetus to Thessaloniki. Let me remind you that for four years, Constantine the Great had settled in a palace built by Galerius and had considered moving the capital of the Roman Empire to Thessaloniki. Then he went to Byzantium and founded Constantinople. 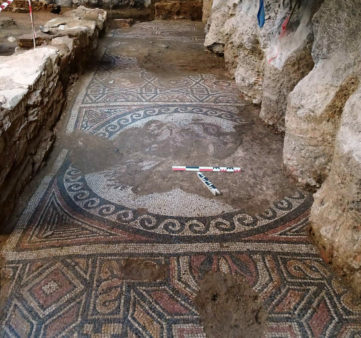 It has only recently been discovered that Justinian was the emperor responsible for the city’s next big redevelopment. Apparently Thessaloniki was as important to Justinian as the works he undertook in Constantinople” she points out. 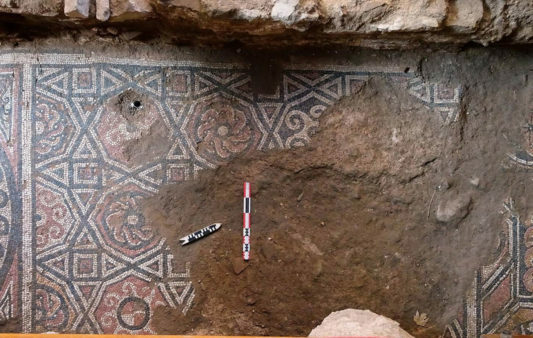 The new finds are situated south of the decumanus maximus, the famous Byzantine highway, while mosaic floors-more of those already found had been located earlier in the immediate vicinity, as for example in 2008, during excavations for the relocation of the central pipeline. “Today we have seen what sort of spasmodic interventions have taken place over all these years and how we ourselves are now also obliged to deal spasmodically with the ancient remains that came to light. In other words both the central pipeline and the posts have done a lot of damage. Naturally, there is a problem when a city is continuously inhabited. 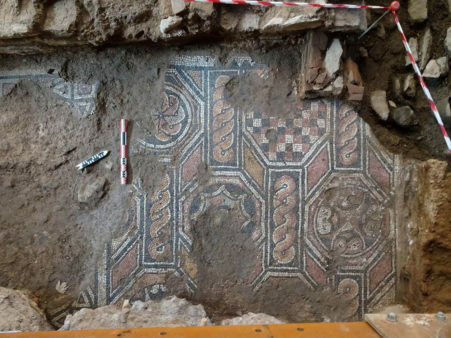 Unfortunately we do not have this villa today and we cannot restore it” said Secretary General of the Ministry of Culture and head of the CAC Maria Andreadaki-Vlazaki, adding that, in compliance with conservation terms, the mosaic floors would have been removed anyway.